Can dated 10/17/18. Light yellow in color with a frothy pure white head. Lots of citrus, mango and papaya on the nose and in the up front taste, with just the right amount of hop bitterness at the end. Drinking this while I'm eating shrimp cocktail, and it goes together really well...somehow. Poured into a tulip. Very hazy/turbid bright yellow color with a large white head. Nice lacing in the glass. Mango, some citrus, and papaya on the nose. The taste follows but the feel was thin to me with prominent carbonation. Dry finish. Overall very good but not great in my opinion. 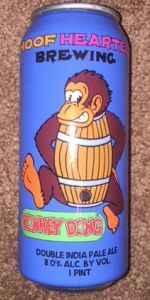 Konkey Dong pours a bright and cloudy yellow-orangish color with a stable 1-finger head that, creamy and lingers leaving some excellent lacing. The smell is big citrus and tropical fruit with orange, pineapple and mango with a hint of pine. The taste is juicy as the tropical and citrus shine through with a bitter bite that quickly mellows, leaving this beer well balanced. Sample at Mikkeller Beer Celebration Copenhagen 2018, Blue Session. Aroma has dextrin malt, vanilla, floral hops and asparagus. Taste has dank hops, milky yeast, soft herbal bitterness with a smooth mouthfeel. Pours a completely hazed bright yellow to orange color, with a stable, huge white head. Offers an intense, citrus leaden tropical fruitiness, defined by passion fruit and luscious orange. Straight forward hop juiciness mingles together to a powerful intensity, amped up by a touch of kiwi. Has a very smooth, creamy mouthfeel, a nice bubbly spark at the back end and a late, longer lasting, fermented lime bitterness. Tastes a little more mellowed out than the nose indicated, with guave, papaya and unripe mango, leading to a slowly uprising lemon dryness, which even more slowly develops a decent bitter note. This creates a great interplay, with a tiny note of malt adding to the fruits, which intensify the flavors even more. Finishes sweeter, full of orange pulp underlined by some cakey malts and a whipped cream covered bitterness. Very well working, incredibly tasty hop profile, topped off by a great, creamy mouthfeel. This is dangerously drinkable for a double Ipa, with a plethora of tropical fruit aromas unfolding on both the nose and palate. An instant classic. very good - not great. Good representation of style but not comparable to the TH best or Trill. A little thin. Flavor is good but the mouthfeel is slightly lacking. I'd drink any day but it's not worth seeking out time and time again. Especially considering how hard it is to get.